If using Homemade Pesto, place basil and pine nuts in food processor. Cover; process a few times with on-and-off pulses. Add garlic; pulse a few times. Slowly add oil in stream while processor is running, stopping to scrape down sides of processor with rubber spatula. Add Parmesan cheese; pulse until blended. To butterfly each chicken breast, start at long side and cut in half horizontally, cutting almost but not completely through. Open chicken and flatten to resemble butterfly shape. 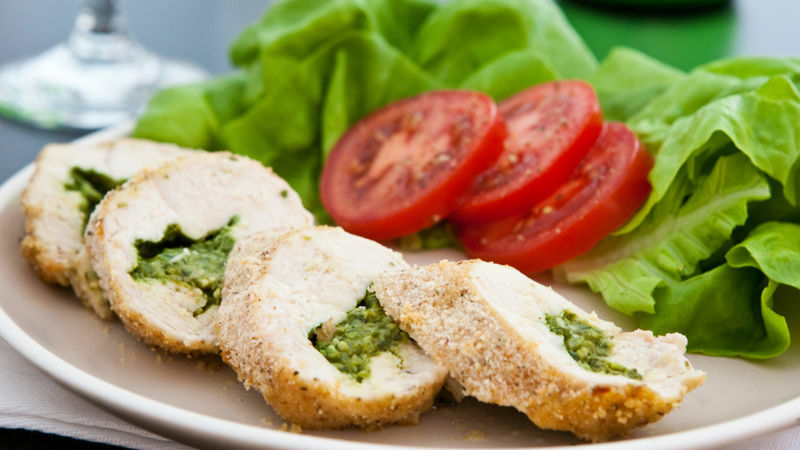 Spread 1/4 cup Homemade Pesto onto each chicken breast; top each with 1 slice mozzarella cheese. Wrap chicken around cheese; secure with toothpicks. In large bowl, mix bread crumbs, salt and pepper. Coat chicken with bread crumbs; place in baking dish. Bake 30 to 40 minutes or until chicken is no longer pink in center. Cut into slices to serve. For more flavor, add 1 teaspoon dried basil leaves to the bread crumb mixture. To make this recipe quicker, omit the bread crumbs and cook the chicken in a skillet that has been drizzled with olive oil.